Bugged by Mosquitos? Try this! 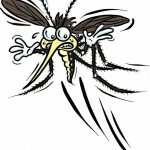 When I’m out walking or running as my weight bearing exercise here in Central Florida, I’m sometimes bothered by hungry mosquitoes. So, what’s a devoted bone builder to do? Spritz the mixture on your pulse points, and no more mosquito bites! The aroma of vanilla blocks mosquitoes’ antennae receptors, keeping them from detecting your scent. 2 Comments on Bugged by Mosquitos? Try this! Can you tell me what Beyond C Powder is? You mention it a lot. Good question, Barb! The short answer is that it’s a synergistic combination of Vitamin C and GMS Ribose that allows the consumption of mega doses of Vitamin C with minimal gas or diarrhea. The long answer is coming up in the next OsteoDiet article, thanks to you!